Glee's Mark Salling is handsome, talented, and part of one of the most popular television shows on TV right now. He couldn't get more perfect, could he? Oh, did we forget to mention he's heavily involved with the Child Hunger Ends Here campaign? Yep, he's the real deal. What can you tell us about the Child Hunger Ends Here campaign? 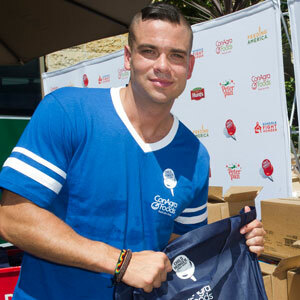 Mark Salling: Well, Child Hunger Ends Here is a campaign brought to you by ConAgra Foods, who makes many of the household products that you probably have in your kitchen, and they're basically doing a campaign where people can save their UPC codes and turn them in and each UPC code of a ConAgra Foods product will translate into a whole meal for a hungry child. So, it's a very smart idea, which is kind of what attracted me to it. I've always been looking out for really simple ways, really clear cut ways people can help. And when I found out that child hunger affects 17 million children in the U.S. alone—Texas being the No. 2 state affected, my native state, I felt like it was a great campaign to jump on board with. And it's really easy to explain to people, too. So as opposed to just writing a check and handing it in, you can save UPC codes from things that you already have in your kitchen. Obviously Glee keeps you really busy. Why is it important that you devote your free time towards helping others? Being on a show like Glee is a blessing and somewhat of a platform to do what I want with it, whether it's positive or negative or nothing at all. I'm choosing to do the most I can and leave the most positive impression I can on people, and I do that with this campaign and I also do that with other wildlife rescue charities. I think everyone needs to have a little charity in their life and this ConAgra campaign makes it really easy for people to do that and it's really rewarding. What's been the most gratifying thing working with the ConAgra campaign? The most gratifying thing is meeting people on Twitter actually saying, 'Hey, I just registered my school, and I just turned in a bunch of UCP codes,' and I know right away that it has made a difference. They can also go to the website ChildHungerEndsHere.com and find out ways to help, or register their school so that their school can make their students and teachers aware of this campaign. And then everyone can turn their UPC Codes into their school and not have to worry about mailing them or anything like that and it makes it very easy for everyone. Even if you're not a student in the school or a teacher you can approach your local school and see if they are interested in being involved. What's coming up for Puck on Glee? Well, Puck is going to be falling for Shelby (Idina Menzel) and trying to make a family out of the situation. And his intentions are good, so I'm sure the outcome will be positive as well. And hopefully he'll have an active role in his daughter's life. What was your reaction when you read the Puck and Shelby storyline in the script? I thought, 'Wow, this is going to make for some very interesting storylines,' and I was definitely right about that. YES, but you need to be with Rachel.. Her DAUGHTER. Besides the love triangle, what else is coming up for Puck? A lot of great numbers, and a lot of good solos!